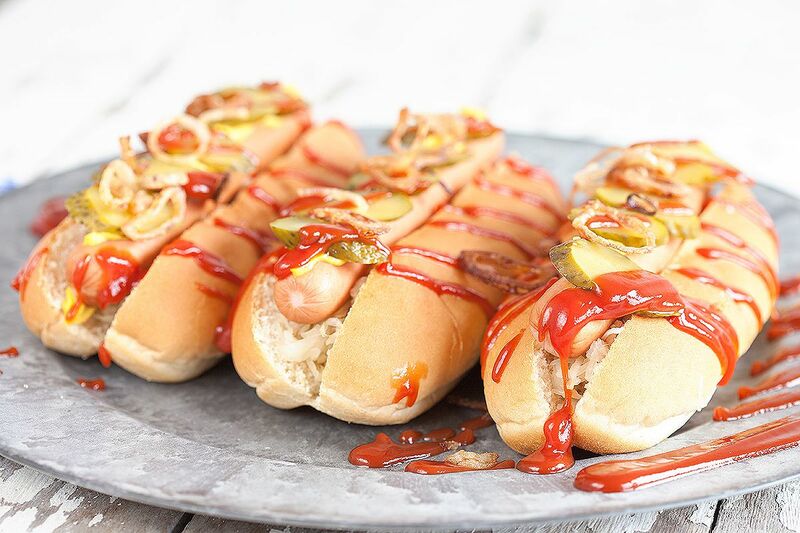 Delicious classic hot dogs, loved by everyone. Can someone wake you up for an awesome hot dog too? Mmm! Ready in only 10 minutes! SLICE the shallots in rings and toss them in a small bowl with the tablespoon of all-purpose flour. HEAT sunflower oil in a small skillet. SIEVE the shallots, so there won’t be too much flour in the oil. FRY the shallots until they’re golden brown, this will take about 2 to 3 minutes. REMOVE them from the oil with the skimmer or slotted spoon. You’ve created your very own crispy onions, the ones you can also buy at the supermarket. 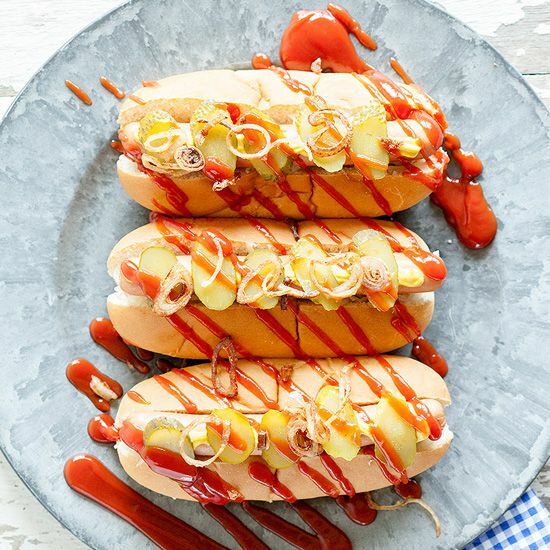 HEAT the sauerkraut in the small saucepan and the hot dogs, with the water from the can, in a small skillet. CUT the pickles in slices. SLICE the hot dogs rolls in the middle and divide the sauerkraut first. 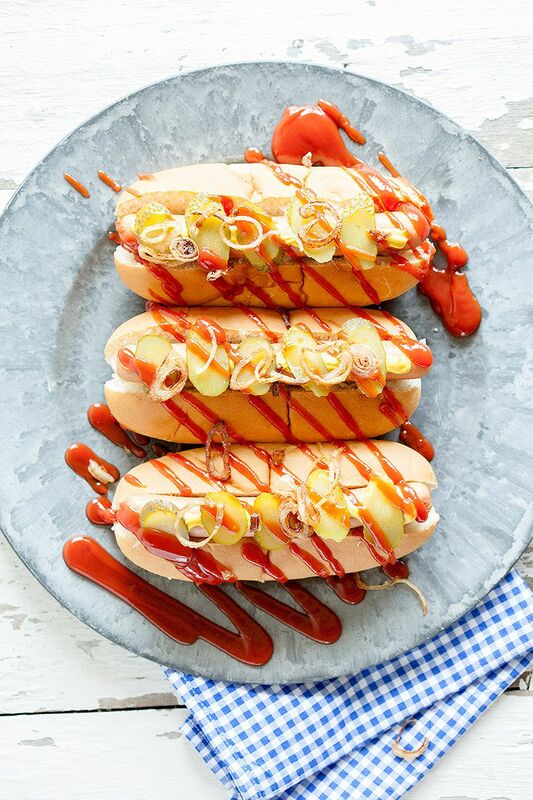 Then the hot dogs, some mustard and pickle slices. Finish them off with a lot of ketchup and the crispy onions. Grab a napkin and enjoy! My daughter sits near me and the computer right now. 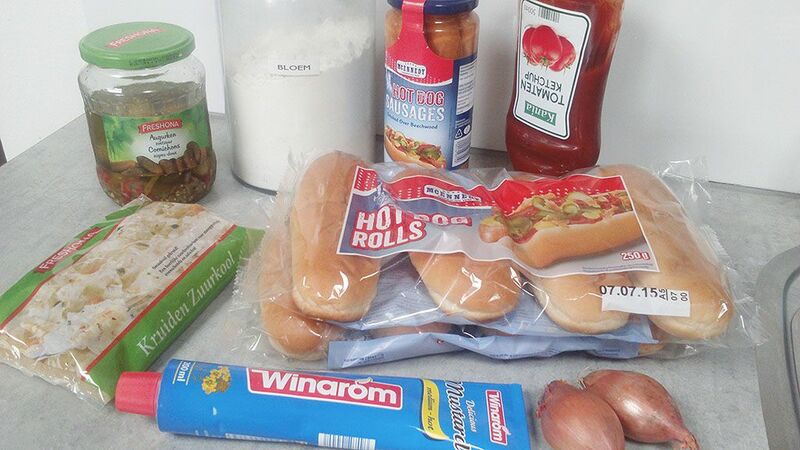 She saw the picture of the hot dogs and shouted: Mama! Can you cook that soon? There! There! Hot dogs!